The facility management has evolved as rapidly developing sector since last few decades. Facilities management has a central role to support business and must be strongly tied with the organisation's strategy in general. Facilities management has developed in the past decade into a major, flourishing business sector and discipline and continues to develop in many countries. The term facilities management has been acknowledged by governments, the business community, educationalists and researchers as vital constituent of business world. Facilities management has great significance to organisations. It has become the focus for the important issues of best value and customer satisfaction within the management of supporting services. The significance of facility management is well recognized in many companies because there is necessity of properly managing complex and luxurious support facilities (Kincaid, 1994). The tasks are multi-disciplinary and encompasses array of activities, responsibilities, and knowledge. If services are properly managed, it enables an organisation to function in efficient and effective way, provide real added value improvements to core business. Facilities management is being promoted to a strategic level of importance and is therefore being given the task and opportunity to contribute to business success and to help the delivery of competitive advantage. Currently, the range of services covered within the responsibility of facilities management and it makes complex to the process. Facilities management has moved into the core operational functions of client organisations. It is required for facilities management service providers and their customers to recognize the role of facilities management in the organisation's strategic operations. Concept of facility management: The notion of Facility Management was evolved in the United States in the 1970s in the business sector of outsourced services. The purpose was to respond to companies' demand to have a capable and specialized single-handed point of reference able to optimise all the activities concerning the management of supplementary internal services which support the business organization. Facility Management has developed with the plan of integrating and coordinating more than one service and accomplishing cost-efficiency for the client. Facilities management is described as an integrated approach to operating, maintaining, improving and adapting the buildings and infrastructure of an organisation in order to create an environment that strongly supports the primary objectives of that organisation' (Barrett and Baldry, 2003). It is also explained as 'the practice of coordinating the physical workplace with the people and work of the organisation. It integrates the principles of business administration, architecture and the behavioural and engineering sciences'. According to Curcio (2003), Facility Management is the integrated management of all no-core business services (for buildings, space and persons) in order to run and maintain the real estate. Theoretical studies have demonstrated that Facilities management is the incorporation of processes within an organisation to maintain and develop the agreed services which support and improve the efficacy of its primary activities. 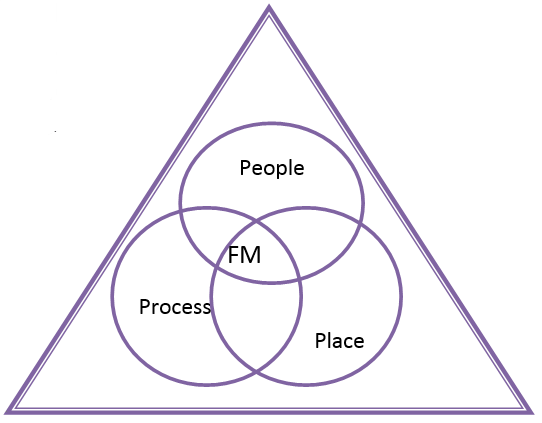 The IFMA model of a triangle of 'Ps', explains facility management in today's work environment that consists of people, process and place. These three factors are mutually dependent and have direct reciprocal relationships. As Armstrong (1982) designated that "we know there is a need to manage the physical environment in concert with people and job processes." Facilities management finds management solutions by positioning itself at the connection of these three factors. Triangle of 'Ps' and FM (Source: IFMA). Facilities management covers multi-disciplinary activities within the built environment and the management of their impact upon people and the place of work. Successful facility management leads to work places which better support the flow of productive processes while adding value and decreasing costs. The scope, range of services, activities, responsibilities, skills and knowledge of facility management are all intended to better incorporate existing organisational factors. Kincaid elucidated facilities management as a support role or service, part of the organisation's non-core business (supply side), and serving the requirements of major activities or core business (demand side). The function of FM is to reunite, through time, these demand and supply aspects in the organization. According to IFMA model, facilities management works in the area of place, but with obligations to support the needs of the people and processes associated with those places. 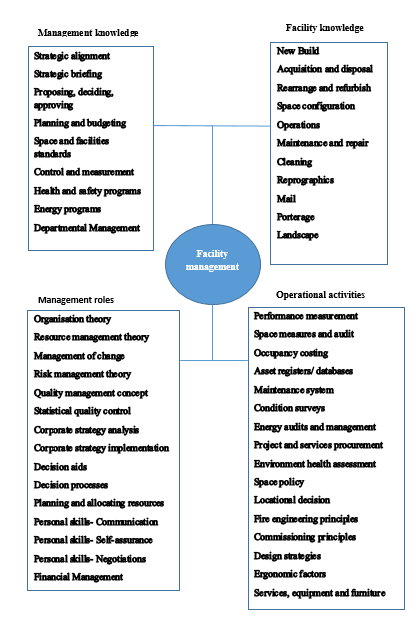 Barrett and Owen (1992) categorize facilities management into two broad ways by function analysis which includes Operational or implementation functions and Management functions. Operational activities are routine support functions of workforce. It includes activities such as the operation and maintenance of overall physical resources to uphold the good condition and appearance of the work place, to add value to physical resources, and to provide a secure and healthy environment for the organisation's main activities. Tasks at this level have a comparatively short-term scope, and involve precise processes, simple and direct, such as cleaning, replacing, repairing, redecorating, and grounds-keeping. Secure arrangements for such routine operations and services are the foundation of good facilities management practice (Nutt, 2002). Another category of facility management is Management functions that can be further divided into at tactical and strategic levels. Tactics are action plans involving routine, specific and short-term preventive or managerial operations (Johnson and Scholes, 2002). Such activities, which are best kept simple, focus, for example, on routine actions such as safety procedures for prevention or proper use and care of maintenance resources. At the strategic level, there is consultation and non-routine planning which intend to make the best, long-term use of the organisation's physical resources and overall facilities. It is shown in various reports that Support activities in facility management can offer both short and long-term support which perform specific tasks at operational levels and conceiving projects and plans from policy and strategy, as well, with a view to what lies ahead in the distant future. The purpose of the organisation, its vision, mission, objectives, core competency and goals. The processes of work, operations and projects. The environmental context, organisational behaviour, culture and market. The product(s), infrastructure, property and facilities. A clear understanding facilitates to devise suitable facilities management strategy and plans, and supports the use of the processes and operations most suited to each organisation in its existing assets and facilities. Scope of facilities management: Many studies have shown that efficient facilities management, combining resources and activities, is imperative to the success of any organisation. At corporate level, it contributes to the delivery of strategic and operational objectives. On daily basis, effective facilities management offers a safe and resourceful working environment, which is necessary to the performance of any business. Kincaid (1994) avowed that facilities management is not limited to the practice of managing the various support services in an organisation instead Facilities management should put together knowledge of both facilities and management in order to work effectively. To summarize, facilities management works with the organization from starting to end in terms of each buildings' life-cycle. It is a conciliator and integrating agent, working to reconcile the demand and supply sides. Facilities management provides and manages array of support services in order to coordinate all the organisation's functions. It focuses on the integration of primary activities on both strategic and operational levels. Facility managers are expected to be well-informed and competent in administrative and leadership skills. Kincaid's four components thus include a wide spectrum of requirements.